Since I was around five or six years old I was always ready and willing to watch any of the Michael Jackson video tapes my family had. Some of them would be in hard plastic covers with handwritten labels that my father stuck on. A lot of the videos we had back then weren’t even in the best condition. After watching tapes over and over, programs like Moonwalker, Making Michael Jackson’s Thriller, and The Legend Continues, showed some signs of wear and tear. But static and noise never really made a difference to me. It felt like Michael was almost always on TV in our house. A lot of people assume that my favorite Michael Jackson special was Moonwalker. I guess it’s because I’m a late 80s baby. But for me it’s always been a tie between The Legend Continues and Making Michael Jackson’s Thriller. And to be honest, Making Michael Jackson’s Thriller is what made me realize that Michael was real a person outside of being an entertainer. He was young, he was vibrant, he was talented, and handsome. He was kind and playful but, was also SO intelligent and commanded respect and attention on the dance floor, the screen, the stage... wherever he was. On top of that, his willingness to do whatever it takes, sitting through hours of makeup and transformation to create the Thriller short film really inspired me. I always remember how much he complained about those yellow contact lenses he had to wear. The introduction from that video tape to a “behind the scenes” Michael Jackson was life-changing for me. Things just seemed so magical wherever Michael was. And I wanted to be a part of that. Here are 4 things I think all fans should know about Making Michael Jackson's Thriller, one of my personal faves! It was released over year and a half after the Thriller album. On December 15th, 1983, 13 months after the Thriller album debuted, Making Michael Jackson’s Thriller was released on VHS Home Video. Making Michael Jackson’s Thriller provided me (and the rest of the world) a closer look at his personality, his dedication to his art, and showed that it took a team of people to make it all happen. I’ve always considered this to be a big part of why I became a fan and always thought that the documentary has been an overlooked part of the usual “Success of the Thriller album” narrative. 2. It was released on home video AND shown on cable/specialized television. Making Michael Jackson’s Thriller was released as a home video, which is the way I first saw it but, was first shown on both MTV and Showtime. 3. Making Michael Jackson's Thriller documentary provided the funding needed to shoot the Thriller short film! The documentary was made to help finance the Thriller short film which cost over 2x the budget CBS Records was willing to spend. (Especially on the seventh and last single of an album.) In his autobiography Moonwalk, Michael Jackson credited his attorney and trusted advisor at the time, John Branca with the idea for a documentary. He shared that Branca (now one of the co-executors of the Michael Jackson estate) thought that a film of the shooting process would help alleviate some of the cost of the video. John Landis however, credited George Folsey Jr. (who produced Thriller and worked with Landis throughout much of his career) with the initial concept. Either way, it was Branca who would negotiate the deal and bring it to fruition. “[John Branca] suggested that we make a separate video financed by somebody else, about the making of the “Thriller” video. It seemed odd that no one had ever done this before. We felt sure it would be an interesting documentary, and at the same time it would help pay for our doubled budget. It didn’t take John long to put this deal together. He got MTV and Showtime cable network to put up the cash, and Vestron later released the video after Thriller aired” (Michael Jackson, Moonwalk). According to a TIME Magazine article from late December 1983, “Sing a Song of Seeing,” MTV paid $250,000 for exclusivity rights to air the documentary and Showtime paid an additional $300,000 for it. They then had more than enough money to finance the 14-minute-long short film. Michael Jackson & John Landis, on the set of Thriller. 3. Making Michael Jackson's Thriller was directed by Jerry Kramer, NOT John Landis. Directed by Jerry Kramer, the 45-minute-long program chronicled the taping of Thriller and included additional behind the scenes footage and interviews to tell the story. From dance rehearsals and choreography, to wardrobe, to the makeup and transformation of Michael from man to werewolf, Making Michael Jackson’s Thriller covers a lot of ground. 4. Jerry Kramer worked with Michael again, when he came back to work on Moonwalker. Kramer did a great job at putting the documentary together, providing great context on how Michael Jackson and John Landis came together to make history, a step-by-step look at the makeup process with artist Rick Baker, and even the composition of the background music used in the short film. In fact, Kramer did such a good job, he was asked a few years later to come back and work on the Moonwalker film, which he did. 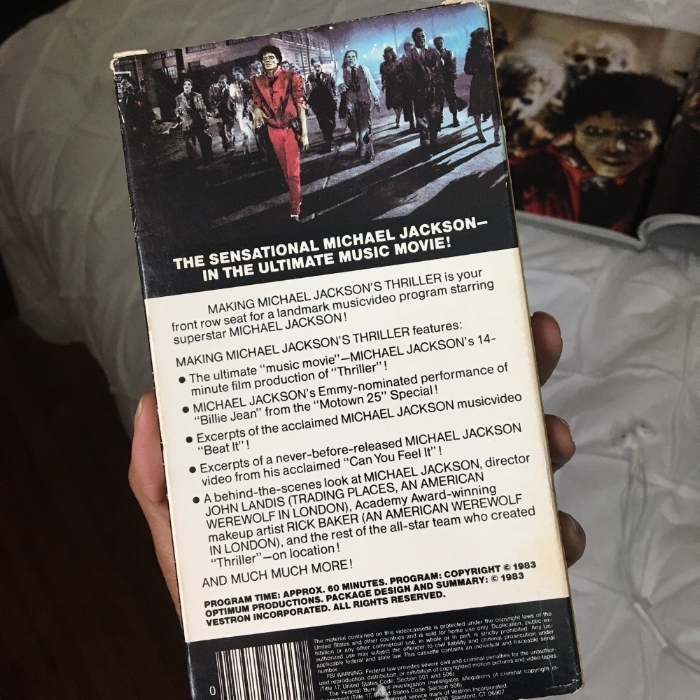 Opening the anthology section of the film, the camera pans along Michael Jackson’s dresser, to show his rhinestone glove, belts, accessories, awards, and later a small television showing clips of Making Michael Jackson’s Thriller, a subtle ode to their previous collaboration. A few weeks ago at the Toronto International Film Festival, I sat a few rows in front of both John Landis and Jerry Kramer to watch both the premiere of Thriller 3D and Making Michael Jackson's Thriller. It was a surreal experience. (I'd began the process of writing this article and had been done a lot of reading about Jerry Kramer and his career a few days before the event. So when he mentioned Kramer, I was very excited to know he too, was there). Following the event, there was a Q&A with Landis, Kramer, and Branca. Kramer shared the reason why the documentary was broken into chapters, citing that there was a push to complete the project to meet the holiday Christmas sales season and every chapter was assigned to a different editor. I would've never guessed! Making Michael Jackson’s Thriller was one of those videos I give credit to for having a huge impact on me as a Michael Jackson fan. It’s one of those things I’ve always dreamed on having on DVD, with of course, some additional never-before-seen footage. But it’s something I also wouldn’t mind waiting for until Thriller's 50th year anniversary or another time in the future. And again, I am so grateful and happy that I had the opportunity to visit and experience one of the places where Michael Jackson made history, even if it was only for a few minutes. I’ll keep my dad’s hand-me-down VCR player and the VHS cassette for times when I feel reminiscent. But then again, it is 2017 and there’s always Youtube. right?